Hindware Appliances is a Consumer Appliances brand by Hindware, a flagship brand of HSIL which is renowned for their trustworthiness for over 60 years. Hindware has made their mark nationwide with their excellent quality control and commitment to customers. They strive to bring superlative design, innovation & unbeatable quality into the lives of all their consumers with their aesthetically crafted, disruptively designed and technologically advanced range of consumer products..
Aiming at a strategic expansion into the Consumer Products Business, HSIL Ltd. forayed into the kitchen appliances category under the brand Hindware Kitchen Ensemble. Further expanding the consumer products portfolio, HSIL entered into an association with Groupe Atlantic of France bringing Hindware Atlantic water heaters into the Indian market. With both these categories performing remarkably well, HSIL entered into air coolers with the brand - Hindware Snowcrest, and into the purifying solutions with the brand name ‘Moonbow’ offering range of exceptionally well-designed air purifiers & water purifiers. HSIL is among the top 500 companies as listed in the ‘Fortune India 500’ 2014 list. With an aim to grow their Consumer Business manifold and to be the leader in the category, HSIL will continue offering top-notch products to the consumers. Hindware welcomes you to the world of enhanced and delightful cooking. 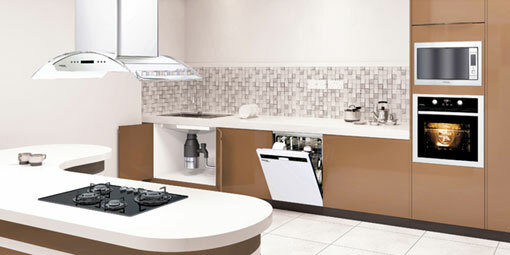 Our exclusive range of exquisitely crafted kitchen appliances are sleek, stylish, durable and high on performance. Hindware’s wide range of Hobs & Hoods are inspired by aesthetically pleasing ‘Italian designs’ and European craftsmanship. The cooker hood range is a blend of futuristic designs and advanced technology. The hood is equipped with a wind tunnel that helps in maintaining a clean, smoke-free and fresh environment. Hindware hobs are all about giving you an effortless and efficient cooking experience. Simply turn on the auto-ignition system to make life simpler. The stainless steel and toughened glass top finish are stylish enough to beautify any type of kitchen. A perfect combination of design and technology at work, the cooktops range not only looks great but also excels in performance. Just choose by type, finish and price from our wide range, and showcase the splendour of your cooking skills. Now, cook anything from curries to kebabs, pasta to paratha. Cook without breaking into a sweat, thanks to the multidimensional capability of our cooking range comprising of brass burners, gas grill, and gas oven. So, keep cooking happiness and make your kitchen lively with Hindware’s wide range of kitchen appliances. HSIL Ltd has forged an alliance with Groupe Atlantic to launch co-branded water heaters in the Indian subcontinent. A collaboration that brings in technologically advanced products to the Indian consumer. With the latest in technological advancement, superior consumer-centric safety features, products made in a state-of-the-art manufacturing plant in Thailand, Egypt, Ukraine, Thailand and Dehradun (India), this association is going to be tremendously beneficial for the consumers and trade partners. Everything around the world changes with time. To be different, it is important to change & innovate and that is what creates trends. Hindware Snowcrest Air Coolers are not just about cooling but a statement of premium living. Hindware Snowcrest introduced for the first time in India, air coolers with changeable colour panels. An artistic mix of graceful snow white coolers with soothing colour on the front panel, to blend seamlessly with your interiors. Their distinguished slender & tall look, coupled with next-generation features like remote-controlled operation, anti-skid top cover, shut louvers and power-packed performance, is bound to capture your heart. 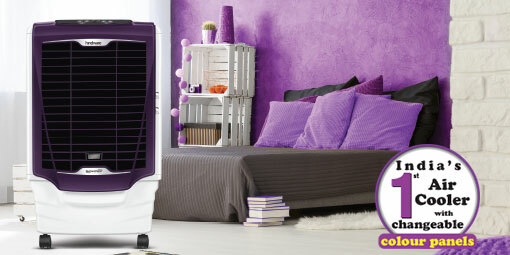 Designed for the most fashionable homes, discover the world of air coolers with ultra-modern designs. It’s cool to be colourful! Moonbow is a brand of Consumer Appliances launched in 2016 with an advanced rage of Water Purifiers and Air Purifiers keeping the neccesities of the consumer on mind. Within a short period of the launch, Moonbow has won prestigious awards like Asia’s Most Promising Brand (2017), Emerging Brand of the Year (2016) and Product of the Year Awards (2016) for innovative and technologically advanced products. Moonbow products are made using world-class quality components and are certified by renowned technology labs like India Water Quality Association and NSF.